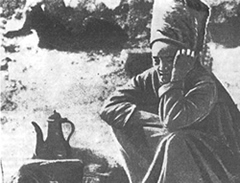 Vertov began to edit documentary footage and soon was appointed editor of Kinonedelya, the first Soviet weekly newsreel. His first film as a director was The Anniversary of the Revolution (1919), followed by two shorts, Battle of Tsaritsyn (1920) and The Agit-Train Vsik (1921), as well as the thirteen-reel History of Civil War (1922). Making these films, Vertov was all the time playing with the possibilities of expressive film editing (or ‘montage’). He started assembling clips of film without regard for formal continuity, time, or even logic itself to achieve a ‘poetic’ effect which would grab the viewers. Vertov proclaimed the primacy of the camera itself (the ‘Kino-Eye’) over the human eye. He clearly saw it as some kind of innocent machine that could record without bias or superfluous aesthetic considerations (as would, say, its human operator) the world as it really was. The camera lens was a machine that could be perfected bit by bit, to seize the world in its entirety and organize visual chaos into a coherent, objective set of pictures. At the same time Vertov was keen to assert that his Kino-Eye principle was a method of ‘communist’ (or ‘true marxist’) deciphering of the world, though this latter tenet was not much more convincing then than now. For Vertov was a true believer and he considered Marxism the only objective and scientific tool of analysis. He even called the 23 newreels he directed between 1922 and 1925 Kino-Pravda, ‘pravda’ being not only the Russian word for the truth but also the title of the official party newspaper. Almost a century later Vertov’s films still look revolutionary. And a contemporary digital video clip screened alongside them might not look so modern (or post-modern) after all. Created from documentary footage, Vertov’s films represented an intricate blend of art and political and poetic rhetoric. The film drama is the Opium of the people…down with Bourgeois fairy-tale scenarios…long live life as it is! The anti-bourgeois cinema itself became bourgeois, because the foundations upon which its theories were based was the bourgeois perception of art. The auteur concept was bourgeois romanticism from the very start and thereby … false! To DOGME 95, cinema is not individual! Today a technological storm is raging, the result of which will be the ultimate democratisation of the cinema. Dziga Vertov, of course, considered his films to be documentaries, records of actuality, but all his work reflected his very personal, highly poetic vision of Soviet ‘reality,’ a vision he maintained throughout his life, long after the dustbin of soviet history had claimed him, too. Very early on, Vertov was attracting unfavourable comment and attention from party hacks, with his strange camera angles, fast cutting, montage editing, and experimentations like split screen, multi layered supers and even animated inserts. By the mid 1920s, Vertov was acquiring the reputation of an eccentric, a dogmatist who rejected everything in cinema except for the Kinoks’ own work. Fortunately Vertov, like Eisenstein, received the close attention and support of the European avant-garde. His feature-length Kino-Eye – Life Caught Unawares (1924) was awarded a silver medal and honorary diploma at the World Exhibit in Paris, and that success led to two more films commissioned by Moscow: Stride Soviet! (1926) and A Sixth of the World (1926). This all looks like a shopping list for a post 1960s Direct Cinema crew and indeed filmmakers like the Maysles Brothers and Fred Wiseman all acknowledged the conceptual debt to Vertov’s ideas and practices so many years before. Thirty years after his time it became possible to apply Vertov’s injunctions without any loss between the idea—to film everything, record everything, to be in life without disturbing or falsifying it—and its realisation. (Vertov had been restricted to filming public manifestations, crowds, ceremonies, etc and was unable to seize everyday life because his equipment could not pass unnoticed). To make The Man with a Movie Camera, Vertov had to accept the invitation of the film studio VUFKU out in the Ukraine. These compromises and changes to Kinok policy led to the collapse of the Kinoks group itself and by the time the film was completed there were already several other ‘city symphonies’ made by, amongst others, Alberto Cavalcanti (in Paris), Mikhail Kaufman (in Moscow) and Walter Ruttmann (in Berlin). Vertov’s chance to be the first amongst equals had been lost in one sense, but his dicta for a new ‘direct cinema’ had not. 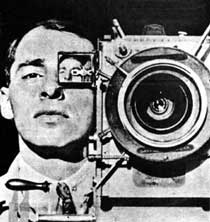 With Dziga Vertov’s Man with a Movie Camera we are at last initiated into the philosophy of the Kino-Eye. Some of us have been hearing a great deal about the Kino-Eye and it has worried us considerably. Only the younger high-brows seem to know anything about it. …Now that Vertov has turned up in the original it is easier to see why intelligent students of cinema were betrayed into their extremity…Vertov, however, has pushed the argument to a point at which it becomes ridiculous. The camera observes in its own bright way, and he is prepared to give it its head. Man with a Movie Camera is in consequence not a film at all: it is a snapshot album. The Griersonian tone of voice is as unmistakable as John Reith’s, the schoolmasterly reproof to a too-clever lad, is sharp. But viewed eighty years on, Vertov’s best film work seems as bright and challenging as so many Grierson productions from the 1930s no longer do. 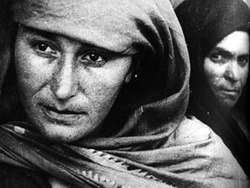 Vertov’s concept of a self-reflective cinema, of the viewer identifying himself with the filmmaking process, would really only reappear at the end of the 1950s in the work of filmmakers like Chris Marker, Jean-Luc Godard, or in America, Stan Brakhage.When sound came, Vertov moved briefly ahead of Eisenstein and most of the other silent cinema masters. He was prepared for the sound revolution because of his early experiments with noise recording, and in A Sixth of the World he had even experimented a la John Cage with rhythmic substitutes for the human voice. 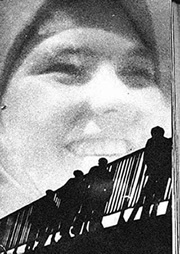 By alternating the phrases with images, Vertov achieved the illusion of off-screen narration. 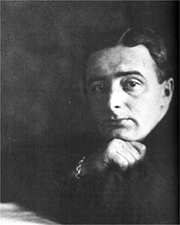 His first real sound picture, Enthusiasm, Donbass Symphony (1931), was an instant success abroad. Charles Chaplin observed that he had never imagined that industrial sounds could be organized in such a beautiful way and called it the best film of the year. Yet, at home, the movie was widely ridiculed despite its apparently very correct ideological position. Vertov’s next film, Three Songs of Lenin (1934), made in commemoration of the tenth anniversary of Lenin’s death, had to wait six months for its official release and in the end, extra footage was added. In spite of these problems, the film turned out to be a popular success both at home and abroad. Again Vertov’s elaborate film structure, the expressive montage and the groundbreaking sync sound shots of people talking, all seemed the essence of modernity. In spite of his international acclaim and acknowledged influence, by the end of the 1930s Vertov was deprived of any serious independent work. He was not specifically persecuted, but was confined to the production of dull and standard industrial newsreels, exactly the same sorts of ‘reality films’ that he had himself so unfavourably compared to his own far more complex and poetic constructs of the perceived world—films he would and could never make again. Six years after his death, the French documentary filmmakers Jean Rouch and Edgar Morin adopted Vertov’s theory and practice into their methode of cinéma vérité. In recent years Vertov’s heritage of poetic documentary has influenced many filmmakers all over the world. In 1962, the first Soviet monograph on Vertov was published, followed by another collection, ‘Dziga Vertov: Articles, Diaries, Projects.’ To recall the 30th anniversary of Vertov’s death, three New York cultural organizations put on the first American retrospective of Vertov’s work, with seminars and curated screenings of films by Vertov’s contemporaries and his followers from all over the world. Just as some feature films—Bullitt (Peter Yates, 1968), or Vertigo (Alfred Hitchcock, 1958), say, with San Francisco, or almost any film set in Paris—capture a particular and enduring sense of a city, so many early documentary filmmakers felt that the modern city itself was the only proper subject of their cameras. 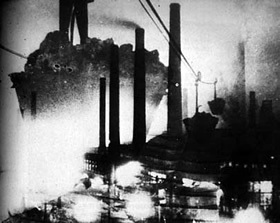 Through this avant-garde genre of the ‘city-film’, which included films as diverse as Alberto Cavalcanti’s Rien que les Heures (1926), Walter Ruttman’s Berlin (1927) and several of the later Crown Film Unit productions, it is now possible to see Dziga Vertov’s work as the most innovative and excitingly free with the new medium of them all. Certainly Man with a Movie Camera, made up as it is of ‘bits and pieces’ of cities from Moscow to the Ukraine, remains a perfect distillation of the sense of a modern city life that looks fresh and true still. In the end this one film is the strongest reminder that, in spite of the extraordinary pressures on his personal and working life, Vertov was one of the greatest of all the pioneer filmmakers. Brief biography and a list of recommended links. A paper on Vertov’s work. Includes a list of references. Links several online articles here. Contains a list of resources on Vertov. A piece on Man with a Movie Camera.